My husband, Andrew Henry, has agreed to snap a photo during his week and share it here on Monday mornings. I've decided to call it Andrew Henry's world because no matter how much time we spend together or how many experiences we share, he experiences and sees them in a different way than I do. During this time of year, Jeanette and I like to take evening walks along a canal close to our home. We saw this brown mass hanging in a tree the other night as we were walking. 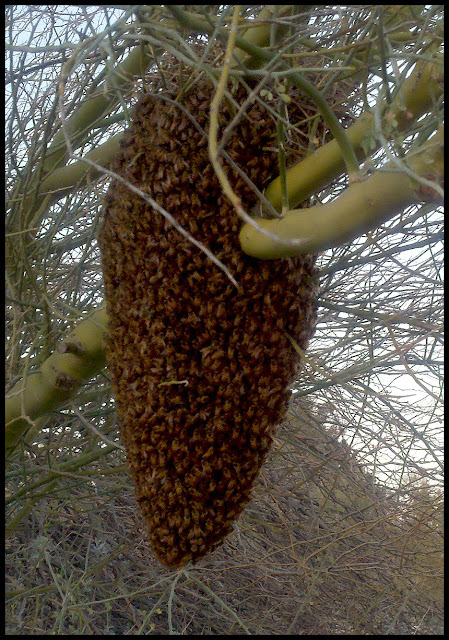 A closer inspection revealed it was a mass of bees. There is nothing inderneath them, they are just hanging there, clinging to each other and there are hundreds of them. There was no noise and virturally no movement. Would you like a closer look? You might be able to see there is a bird's nest right above them. We went back the next night but they were gone. There was nothing there at all. I wonder how many people were lucky enough to notice it? Jeanette here - I'd like to add that AH took those photos with his phone so he got uncomfortably close! As someone allergic to bee stings - I am amazed by these photos from several standpoints (my own personal standpoint would have been much further away :-D) but how wonderfully marvelous a vision to happen upon. That canal never disappoints, does it?! Loving this little peek into AH's world! On a side note - let's all be praying for the people of Japan- our hearts are heavy for them. That is amazing. It is very beautiful and very creepy. Happy Monday! Wow! Kind of scary. We had a bee hive in a little hole in our front porch. It was actually a hole for a shutter and the bees got in. Twice. It cost us about $350 each time for bee removal. Thankfully, the second guy got rid of the hole. WOW thanks for sharing..unbelievable.....crazy that you where there at the right time!..lucky for us! I love this idea! Wonderful photos and great story--great to have the whole family involved! We get those a lot around here- they just stop rest then move along. Fabulous pics! Happy to see the bees en masse, we need the bees! Wow that is SO cool! The funnel shape is amazing. Wow. That's crazy! I can't wait to have some neat Arizona adventures soon! Thats amazing! But I cannot believe how close you got!!!! All the antique pieces in your shop are beautiful! I definitely see them pairing perfectly with my jewelry designs from Bunnie Bee Jewelry. what in the world was going on i wonder???? Krystal, we looked it up yesterday. I guess, as Ren says, they are resting - looking for a new place to build a hive and the queen bee is in the middle of this group resting while scouts go out and hunt for locations. Nature is astounding. I really like this new Monday post. What a great idea for a look at Andrew Henry's world. Even though I am allergic to Bee stings, I love them and I am very concerned that they seem to be in trouble. I make sure my rosemary bushes in my front yard are in good condition because the Bees love them. 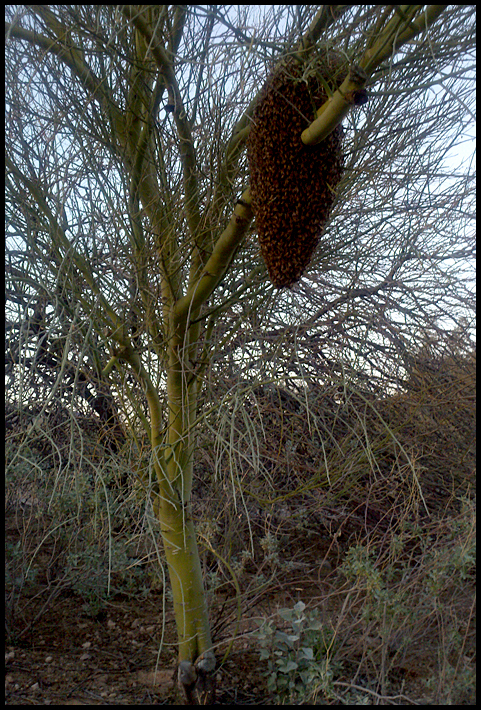 In the spring and summer they are covered with bees. What is interesting that they don't seem to care that you are there and never bother anyone, just keep on working. I live with very polite bees. This is an amazing picture. You were too brave to take a picture of this. GADS! i would not have been able to go that close. how incredible. Great idea for your Monday posts! And wow, what a photo - wonder where the all buzzed off to next? I love your comment, parsnip... "I live with very polite bees." What a happy way to look at the world. WOW - incredible inside look at nature's wonders!! And yes, he must have been frighteningly close! I look forward to seeing more of Andrew Henry's world! whoa! i would not have gotten close enough to take a picture. terrified of bee stings! What a great phots for a phone-and no thank you, I would not like to get any closer. We too view things differently. For example: Taking a photo. He views the Eiffel tower on it's own, unobstructed. And I view it with him in front of it. Fun post today. Love the idea of your husband's perspective. A true gift of serendipity.